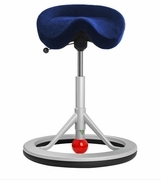 On Back App 2.0 you sit with your feet on a footrest padded with a soft damping material. The sitting position and the gentle motion ensure a wonderful sitting experience. This is a chair that gives you something extra. The gentle movement of the Back App exercises the muscles that support the spine. The movement when sitting on the Back App comes about because you constantly have to balance yourself. The ball is molded onto a tube that can be screwed into and out of the aluminum frame to control the tilt of the chair. The seat is slightly smaller and neater than before and has a rounder shape with a central slot to reduce pressure in the prostate area.